Sometimes businesses and organisations get to the point where reductions in the cost base are vital for the future of the organisation. Many organisations approach this dilemma in an over simplified manner – if a 10% cost reduction is needed every manager and every budget shares the hit equally. It assumes that reducing costs will not adversely impact the delivery of outputs or performance. It creates the high probability that in cutting cost, essential activities, capabilities and assets are damaged, resulting in a downward spiral. Can a business transformation approach be used to deliver cost reduction? Yes – but the cost improvement must be seen as only the first step. Many leadership teams take the “percentage across the board” approach because they do not want to face the challenging and tense discussions that a planned approach demands. The business transformation approach however requires hard thinking and tough talking. The identification and agreement of the core capabilities and assets of the organisation by the senior leadership team – the identification of what must be preserved at all costs. It is best when this is done in an analytical way that can also be used in the subsequent transformation steps. 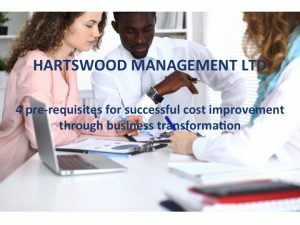 The reduction in the number of business priorities is critical in order to allow a sharp focus on delivering the cost reduction. The adoption of an analytical approach for identifying cost reduction based on business process rather than simply by function. This will help to identify which activities are adding least value. The communication of the financial and performance challenges to the whole organisation. The temptation is to bury bad news but it will only store up more mistrust and resentment for later. The high cost base is an indicator that the current organisation is not sustainable and needs radical transformation. Embarking on a business transformation programme can deliver short-term improvements and lead to longer-term viability. Review approaches to identifying and agreeing your organisation’s core assets and capabilities. Audit the current business priorities. Using a pre-mortem approach decide which are really important enough to continue. Review approaches for identifying cost reduction opportunities using business process analysis. Read Changing Spots – a systems approach to change management for a structured approach to look at the approach to organisation-wide communication during change programmes (see www.changingspots.co.uk).